When she was diagnosed with stage two breast cancer in 2014, Noelle Giddings of Sag Harbor already had a lot of awareness around the disease. Her mother had it, two of her mother’s sisters had it and she said she sometimes felt like it was a matter of “when, not if” she herself would face the disease. These two women’s experiences suggest that public awareness of the risks, detection methods and treatment options associated with breast cancer varies widely, even since National Breast Cancer Awareness Month was established in 1985. That year, the American Cancer Society partnered with a pharmaceutical company to launch the National Breast Cancer Awareness Month campaign each October. This time each year, fundraising events are common and pink ribbons are everywhere — but local medical professionals and advocates say more needs to be done. “The awareness should be throughout the year. We have one month. 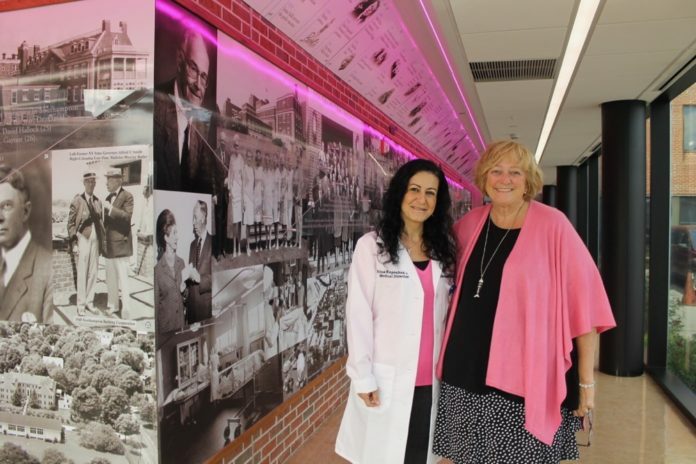 It’s something to bring attention and hopefully keep the attention for the whole year,” said Dr. Edna Kapenhas, a breast surgical oncologist and researcher who is also the medical director of the Ellen Hermanson Breast Center at Stony Brook Southampton Hospital. According to Dr. Kapenhas, one in eight women in the United States will be diagnosed with breast cancer in her lifetime. Men can also develop breast cancer, but at a much lower rate than women; according to the American Cancer Society, their risk is one in about 833. Mammograms are recommended for women ages 40 and over, and self-exams are recommended for women of all ages. At Stony Brook Southampton Hospital, Susie Roden, the patient navigator and outreach coordinator at the Ellen Hermanson Breast Center, said “there’s no excuse” for not getting checked out. Information about services at Stony Brook Southampton may be found online at southampton.stonybrookmedicine.edu/services/breast-center. Roden encourages women to put a greater emphasis on self-exams – and self-care overall. Dr. Kapenhas and Roden said part of awareness is understanding not just the need to get checked out, but also the fact that treatment and support have greatly evolved and improved in the last several years, so patients have less to fear. Still, myths and misconceptions about breast cancer remain. One of those misconceptions is that careful attention to overall health and fitness equates to absolute protection against illnesses like breast cancer. While medical professionals say proper fitness can lower the risk of certain types of cancers, breast cancer can still strike, particularly if there is a family history of it or if someone has the genetic marker for it. Ms. Giddings, for instance, is a two-time cancer survivor, having beat thyroid cancer 18 years ago before her breast cancer diagnosis four years ago, despite careful attention to her well-being. She’s been a marathon runner for many years and said she has always maintained a healthy diet. The National Cancer Institute, however, says there is a link between physical activity and better post-cancer outcomes, such as a 35 to 49 percent lower risk of death for breast cancer patients who engaged in moderate physical activity for one hour or more per week. Another myth, Dr. Kapenhas said, is that needle biopsies – one of doctors’ preferred diagnostic tools – can cause cancer to spread. “That is absolutely incorrect,” she said. She also said women sometimes believe they should avoid mammograms because they do not want to be exposed to radiation. Roden said another myth is that only menopausal women will develop breast cancer. Denise Roeloffs of Sag Harbor, who beat breast cancer in 2011, said overall awareness of the disease – she, too, has a close relative who had survived breast cancer – helped her become sensitive to the fact that something was amiss with her own body. When she felt something was off, specifically swollen tissue underneath her arms rather than a lump in one of her breasts, she knew to get it checked out.